There’s something eery about standing in the middle of a battlefield by yourself. As I watch the wind blow through the tall, stringy grass, rolling across the field like waves in the ocean, sparrows chirping quietly overhead, I realize how different today is from 150 years ago when war raged on the Gettysburg Battlefield during the American Civil War. No longer are hundreds of bodies strewn across this small field, no cannons echoing in the distance, nor the cries of dying men. Instead, it’s peaceful, as if nothing had ever happened on this rural farmland in Pennsylvania. I decided to visit Gettysburg National Battlefield in Gettysburg, Pennsylvania in commemoration of the 150th anniversary of the battle. It’s somewhere I’ve been many times before, but always with family, friends, or a school group, never by myself. However, visiting alone allowed me the chance experience the battlefield at its most peaceful. Looking over the field, it’s hard to imagine what it looked like in early July of 1863, when over 165,000 troops fought on these open fields. All told, over three days of vicious fighting, over 45,000 soldiers were killed, wounded or captured, making it the bloodiest battle ever fought on American soil. While exploring the battlefield, I decided to put together a video of experience. 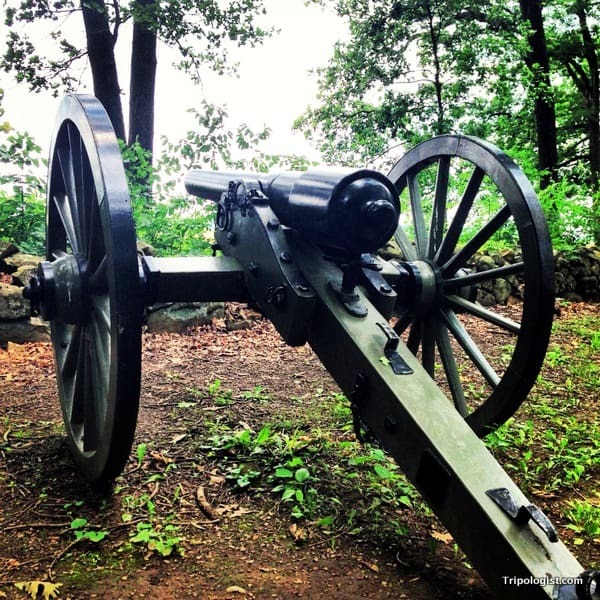 This video is a brief introduction to the sights and history of the Gettysburg Battlefield in Pennsylvania. Take a few minutes to watch it, and then let me know what you think. For more information on how you can visit the Gettysburg Battlefield, scroll down below this video. Gettysburg Battlefield is located in South Central Pennsylvania, approximately 1.5 hours from Washington, DC, 2.5 hours from Philadelphia, and 3.5 hours from New York City. Entrance to the battlefield and the surrounding area is free. Unfortunately, there is no public transit to Gettysburg, meaning that you will have to drive yourself. The only other option is taking a day tour from Washington, DC. Once you arrive in Gettysburg, your first stop should be the Visitors’ Center. Inside, there is a great museum about the battle ($12.50 for adults) and a gift shop. This is also where you can arrange a guided tour if want one. If you plan on touring the Gettysburg Battlefield on your own, the Visitors’ Center also has self-guided tour maps or you can buy an audio guide from the gift shop. While on site, it is advisable to drive your car between the destinations as the distances are quite far. Parking is available at every major and minor stop. Make sure to pay careful attention to the roads, as many are one-way. For more information on visiting the Gettysburg Battlefield, visit the official website or my Pennsylvania travel blog, UncoveringPA.com. Find somewhere great to stay in Gettysburg, PA! If you want to learn more about the Battle of Gettysburg, but can’t visit, I would highly recommend the 1993 film “Gettysburg”. Great video! I love the use of the music from The Civil War PBS series. Battlefields can be hard to see if they aren’t well signposted or laid out for visitors, but Gettysburg is probably the easiest to follow of any of the ones I’ve been to. The number of casualties in the battle are dumbfounding, for sure. I’m glad you liked the video. Gettysburg Battlefield is very well laid it. It’s almost like a very spread out, open air museum. I wouldn’t think an actual guided tour would be necessary unless you were a real Civil War buff.